Golden Technologies has taken the Monarch lift chair and made it even better. The Monarch Plus, PR359, now comes standard with a full chaise seat pad for more luxurious comfort. 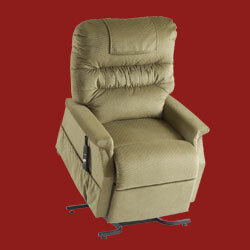 Like our original Monarch, the Monarch Plus is a distinctive lift/recliner that combines a generously stuffed seam back with a soft supportive seat. Its three way recline system allows you to get into our "full napper" position for deep comfort. The Monarch Plus comes standard in our luxurious SofTouch fabrics: Rose, Sapphire, Sage and Cognac.